„If you’re not an optimist you shouldn’t be in science"
says Mel Greaves, Professor of Cell Biology at The Institute of Cancer Research in London. "I wouldn’t have spent my life working on the very complex problems of cancer, specifically on childhood leukaemia, if I didn’t believe they could be solved. Prevention remains my overriding ambition." His work has led to new diagnostic methods and fundamental insights into the pre-natal origins, natural history and causation of the disease. By 2025 the man with great intellect, eloquence, charm and sophisticated humour expects the prognosis to be favourable, as he writes in his book "Cancer – The Evolutionary Legacy", which was first published in the year 2000 ("Krebs – Der blinde Passagier der Evolution). The basic thesis is that cancer is an inevitable consequence of our make-up as multicellular, complex and long-lived animals whose social behaviour is now very mismatched with prior genetic selection. He shows that the evolutionary perspective leads to better understanding of cancer and opens new ways to prevent or treat it. 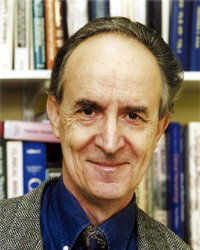 Mel Greaves, who much admires Nelson Mandela for his courage and humanity, has been the recipient of numerous international awards, including the prestigious King Faisal International Prize for Medicine and is a Fellow of The Royal Society. Mel Greaves, born in 1941, trained as a biologist at University College London in the nineteen sixties. "I had wanted to do medical research since I was about 17 years old", he remembers and adds with a smile: "But this came only after I had disgarded more exotic goals like becoming an astronaut or a tennis superstar." "I enjoyed school very much and was fortunate to have gone to one of the state funded grammar schools in Norwich. These schools selected pupils on merit – now considered socially discriminatory – and provided an ‘escape route’ into the professions for kids like me who came from relatively poor, working class backgrounds." He was good in English literature, history and arts. He loved biology, "but I couldn’t stand or understand chemistry – or at least the way it was taught". His interest in immunology and evolution – "Charles Darwin is a top man, his key idea and explanation of evolution by natural selection was and still is the most profound concept and insight to emerge from biology with massive social and medical implications" – drew him to medical research. "I had a colleague working at Great Ormond Street Hospital for Sick Children (London) who took me around the wards at a time when my own – now adult – children were three and four years old. I saw children the same age stricken with leukaemia and found it appalling. When I asked ‘What is leukaemia? What is the underlying problem here?’ it was absolutely clear that ignorance was pretty rampant. We had no idea about the nature of the disease except that an expanding population of cells was damaging the bone marrow and children were dying. I felt that this must be a tractable problem, so I started asking simple biological questions such as ‘What sort of cell is involved?’" So it was emotion as well as pure science that drew him to a lifelong research of cancer. Mel Greaves, so friends of him say, has besides his scholarly rigour, a big heart. "My view about all cancers, including children’s cancer, is that you get the disease because of a combination of circumstances – genetics, exposures, dietary factors, energy balance – and sheer bad luck. We were able to show that the mutant genes driving childhood leukaemia arise in the developing baby in the womb, and that other mechanisms come into play after birth. Being able to plot the development of the disease, understanding its biology and mechanics has had an impact on diagnosis and therapies. But though I’ve been pleased by the advances in treatment, still not everybody is cured." But – as an optimist – he believes that in the next years research will finally be identifying the major causal factors of the disease – "the exposures that matter, the genetics and dietary factors that matter. In childhood leukaemia, I’ve long believed that an abnormal immune response to common infections is the major causative mechanism and evidence supporting this is now substantial. Once the bigger picture is less fuzzy, we can then take some concrete steps towards prevention. But the natural pace of these things is slow." But still faster that some people believed. In January 2008 a breakthrough study of identical twins has for the first time confirmed the existence of cancer stem cells that cause the most common form of childhood cancer, acute lymphoblastic leukaemia (ALL) – backing evidence that this childhood cancer starts in the womb. "This study of a twin pair discordant for leukaemia has identified the critical stem cells that initiate the disease and maintain it in a covert state for several years. We suspect that these cells can escape conventional chemotherapy and cause relapse during or after treatment. These are the cells that dictate disease course and provide the bull's eye to target with new therapies", comments Mel Greaves, co-author of the paper, which was published in "Science". Mel Greaves, who has influenced cancer research worldwide, is modest: "Pride comes before a fall, it’s said. So I try not being too pleased with myself even on the rare occasions when it might be justified. It is a great privilege to be a career scientist, paid by public funds, essentially, to have fun exploring the unknown." And very seriously he adds: "With this does come some responsibilities. These include integrity, honesty and ethical conduct. Some things we could in theory do should be ‘out of bounds’; like reproductive cloning (of humans), unjustifiable experiments on higher primates and clinical research without full, informed consent." But the choice of what to work on, so Mel Greaves says, should be driven by interest or curiosity. Mel Greaves has many interests outside of science. He likes good wine, Bach, Mozart and the classical operas. "They have become much more appealing as I’ve become older and it’s a shared pleasure with Josephine, my wife and partner." He reads modern novels, watches soccer, rugby and tennis – "though I am now a passive and arthritic sports fan". Most of all Mel Greaves loves to play with his grandchildren. "The happiest moments, where the word ‘joy’ applies, are non academic and more personal. Especially with my children and now with my grandchildren." Mel Greaves trained in Zoology and Immunology at University College in London and Stockholm before focussing his research in cancer and leukaemia in the mid-1970's at the Imperial Cancer Research Fund. Earlier in his career, he introduced new methods for biological classification of leukaemias that led to insights into the cellular origins of disease and more specific allocation of treatment. His work on the molecular genetics of childhood leukaemia has uncovered the pre-natal origin of this disease and shed light on its possible causes. This research has been recognised by many national and international awards including the José Carreras Award, the British Society for Haematology Gold Medal and the King Faisal International Prize for Medicine. Professor Greaves has eclectic interests in biology, cancer and medicine and is the author of the popular science book – 'Cancer. The Evolutionary Legacy' (Oxford University Press). 1968 PhD, Faculty of Medicine, London University. 1968-1969 Wellcome Travel Fellowship: Immunology Group, Department of Bacteriology, Karolinska Institute, Stockholm, Sweden. 1969-1972 Research Scientist: Immunology Division, National Institute for Medical Research, Mill Hill, London. 1972-1976 Research Scientist: Imperial Cancer Research Fund, Tumour Immunology Unit, Department of Zoology, University College, London. 1976-1984 Head: Immunology Laboratory, Imperial Cancer Research Fund, Lincoln's Inn Fields, London. 1984-2003 Director: Leukaemia Research Fund Centre, The Institute of Cancer Research, Fulham Road, London. 1977 The Paul Martini Prize (Martini Foundation, Gottingen University, Germany). 1981 The Peter Debye Prize (University of Maastricht, Holland). 1984 Elected Member of the European Molecular Biology Organization. 1986 Honorary MRCP (Royal College of Physicians, London). 1988 King Faisal International Prize for Medicine (jointly with Professor Janet Rowley). 1973 British Association for the Advancement of Science: The Darwin Lecture. 1980 The Leukaemia Research Fund (UK) Annual Guest Lecture. 1981 The J Siegal Memorial Lectures in Cancer Research, Hadassah Hospital Medical School, Jerusalem. 1982 The Stohlman Memorial Lecture, Wilsede, Germany. 1985 Jenny Leukaemia Trust Visiting Lecturer, Sydney, Australia. 1989 Lo Yuk Tong Foundation Lecture, University of Hong Kong. 1990 The Karolinska Institute Annual Clinical Science Lecture, Stockholm, Sweden. 1991 Carter Lecture, Clinical Genetics Society, Bristol. 1992 Lambrick Lecture, University of Birmingham. 1996 Nordic Society for Paediatric Haematology and Oncology Annual Guest Lecture, Oslo, Norway. 1996 The Annual Nesbit Lecture, University of Minnesota Cancer Center, Minneapolis, USA. 1998 The Kenneth B McCredie Memorial Lecture, Leukemia Society of America, Arizona, USA. 1999 Annual Guest Lecture and Gold Medal, British Society for Haematology, Brighton. 2000 Paul Noone Memorial Lecture, Royal Free Hospital, London. 2001 José Carreras Lecture, European Haematology Association, Frankfurt, Germany. 2002 The Gordon Bloom Annual Lecture, Children’s Hospital, Boston, USA. 2003 The American Society of Clinical Oncology Pediatric Award Lecture, Chicago, USA. 2004 Annual Guest Lecture, Swedish Medical Society, Gothenburg. You need at least Flash Player 8 to see the movies.